The table saw is a necessity in any woodworking shop. You can use it to rip or cross cut wood and it is very useful making joints. Buying the right table saw is important. You can easily cut dadoes, cove molding, rabbets, tenons, and grooves. It can also cut at a variety of angles. There are countless jigs you can buy or make, to add to the versatility of a table saw. 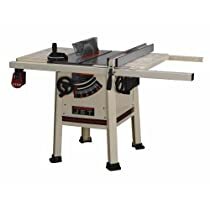 Bench top (not recommended) Only buy a bench top table saw if you absolutely don't have room and will need get it out and put it up frequently while working on a project. This type saw usually has a thin metal top or one made of aluminum to reduce weight. The fence is not of the quality you can get on a contractor saw. Usually under 100lbs. Contractor (recommended) Usually a heavier saw with cast iron top. You can get cast iron wings also and some come with a pretty decent fence. This type saw is more stable and come with a enough power for your average woodworker. From over 100lbs to around 400lbs. Cabinet (Highly recommend) The Cadillac of table saws. Very stable and able to give quite precise cuts. More power for thicker cuts and come with a quality fence. From over 300lbs to some I've seen weigh in around 1500lbs. As with any tool I recommend buying the best tool you can afford. The tool will last longer, and give you better results. It can also help make your woodworking project easier to build and lessen the time it takes to build it. Buy the best table saw you can. It will make your woodworking easier and save you time and money in the future. I started with some of the cheapest woodworking tools known to man in the beginning, thinking one will work as well as another. It only cuts right? I can buy a better blade and not tell the difference right? NO! By the time you finish fighting with the cheap guides and adjustments these tools have to offer, your woodworking project goes from pleasurable to stressful very quickly. The quality of your woodworking depends on Straight, precise, smooth cuts. 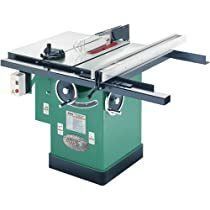 I recommend buying one of the following table saws for anyone wanting better results from there woodworking projects. any of these saws are a great starting point. You can add table saw accessories later as you need them. Get the saw then see what you need as your woodworking progresses. Don't waste money on all the extras you don't need. 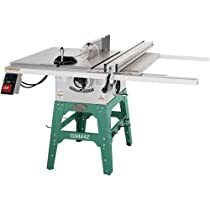 Grizzly G0444Z 10" Table Saw 2 HP Single-Phase 220V w/ Cast Wings. Jet 708480K JPS-30: 10" ProShop Table saw 1-3/4HP 30" Rip Fence with Steel Wings Workshop Table saw offers you a good choice saw that will work for you for decades to come. If your serious about wanting a saw to do all you will need, then check out these.